Waste management, recycling and transport company Wicks Group, has replaced its original horsebox with a new state-of-the-art Volvo 6×2 version that is a pure thoroughbred. 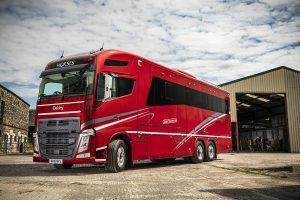 The new-build high-tech horsebox is built on a Volvo FH13.460 6×2 chassis with a 12.8-litre Euro 6 engine, boasting 460hp and 2,300Nm peak torque, and the 12-speed I-Shift automated transmission. To assist maximum performance levels and deliver a smooth dynamic acceleration from the driveline, the new arrival is fitted with Volvo’s I-Shift Dual Clutch which creates a relaxing environment for horses and ponies when travelling to events, as it removes any lurching effects when between gears, something that occurred in the outgoing two-axle 16-tonne manual truck. Volvo removed the bunks in the Globetrotter XL cab and added two extra seats for passengers, before the chassis-cab went to Oakley Coachbuilders in Ware, Hertfordshire. There it was fitted with the Supremacy horsebox body, which includes a kitchenette, shower, three double beds and satellite TV. Volvo Trucks are a mainstay in the Wicks Group 20-strong mixed vehicle fleet, which ranges from 18 to 44 tonne gross vehicle weights.